A notice to the readers after 30 days of reports: I’m still deciding when the daily debriefs will have to switch to a weekly update. The amount of data and interesting facts is in fact decreasing each day while the comments you leave on each debrief and the email I receive are so interesting that they require a better analysis and more in-depth replies. For this reason, I suggest you reading the comments and replies on each debrief to follow the discussions that sometimes have become a continuation which add more interesting details to the daily reports. In the meanwhile, beginning tomorrow, you’ll find the list of links to the previous reports on a dedicated page whose link will be the only one preceeding the daily recap. This should make the text easier to read (at least there will be no need to scroll down the page to find the beginning of the article). 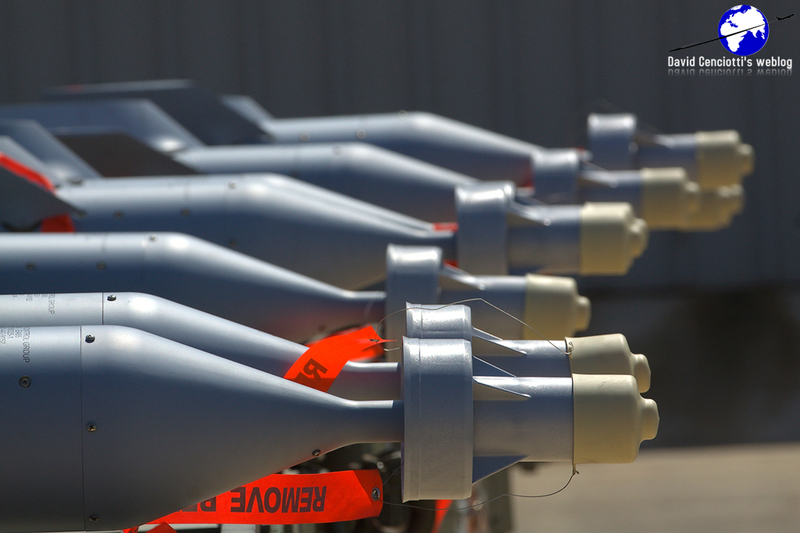 Targets were given for NATO to take out. Our forces then moved towards the east of Brega. We were surprised by a massive attack against us even though NATO had assured us there was no one there. We pulled back and directed NATO where to attack but they didn’t do anything. Clearly, there must be some sort of poor coordination between NATO and rebel forces in spite of the small British military team, acting as a liaison team between rebels and NATO and advising anti-Gaddafi fighters on how to organise their command structure and communications. A sandstorm (this time witnessed by local reporters…) prevented NATO planes from targeting Gaddafi’s forces allowing them to advance once again on the western edge of the city of Ajdabiya. 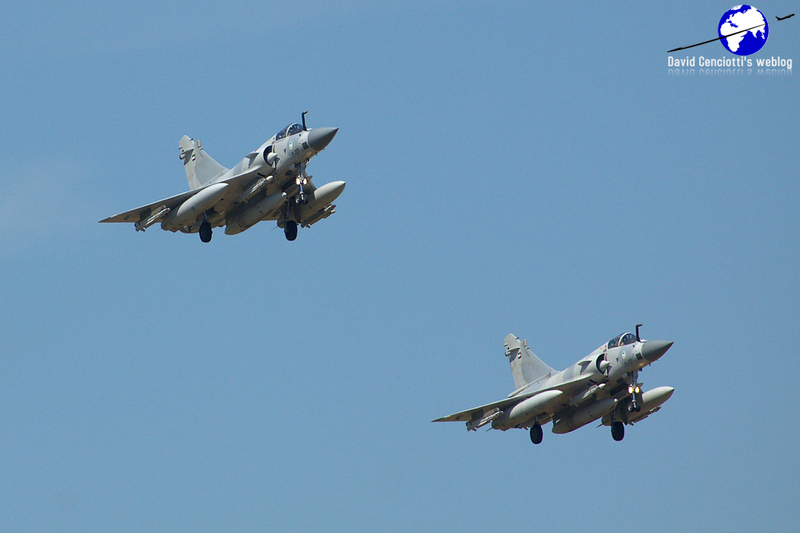 Allies bombed Al-Hira, 50km south west of Tripoli and Sirte where probably the weather was better. Needless to say, Misratah is still under heavy shelling: according to some source 1.000 died and 3.000 were wounded (80% civilians) in the loyalists attacks of the last weeks. 1) Many readers and Twitter followers asked me to prepare a graph showing the trend in the air strikes vs overall sorties since the beginning of Unified Protector. 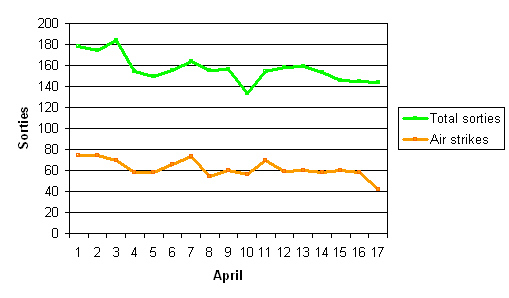 Using the figures released by NATO, I prepared the following simple graphs which show a slight decrease in the number of air strikes flown by the allies in Libya. 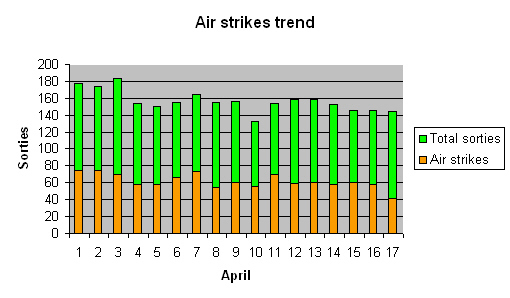 Noteworthy, on average, no more than 40% of sorties are air strikes: considering that “strike sorties are intended to identify and engage appropriate targets, but do not necessarily deploy munitions each time”, the amount of firepower dedicated to the enforcement of the NFZ (meaning fighters in Combat Air Patrol with air-to-air missiles) is excessive if compared to that capable of bombing ground targets, especially if we think to the almost complete lack of Libyan Arab Republic Air Force activity. Since figures released by NATO refer to “the previous 24 hours” embracing 2 different dates, I thought it was better to use the release date as a reference. 2) Richard Clements sent me the link to an interesting article, titled “Mysterious Libyan Pipeline Could Be Conduit for Troops”, published in Dec. 1997 by the NYT (you can read it here on the FAS website). A tunnel of pipes 4 meters, or 13 feet, in diameter is large enough to accommodate military vehicles, even a rail line. When the project is completed, Libya will have more than 2,000 miles of tunnel stretching from Tunisia to Egypt. In the south, it will reach almost to Sudan and Chad, a country with which Libya has tense relations. Every 50 to 60 miles along the pipeline, huge underground storage areas are being constructed, and the engineers said they are more elaborate than would be needed for holding water. The facilities, made of reinforced concrete, would be suitable for bivouacking troops or storing military supplies, including poison gas, the engineers said. While the system of pipelines does not by itself change the military balance in the region, it provides Col. Moammar Gadhafi, the Libyan leader, extensive opportunities to conceal his activities from the American spy satellites that pass overhead each day. “This is the first real evidence of something which has been suspected for several years,” Paul Beaver, a defense and intelligence analyst with Jane’s Defense Weekly, said when told of the engineers’ descriptions of the project. “Gadhafi seems to have taken a leaf out of Kim Il Sung’s book and created a potential military arsenal underground,” he added, referring to the late North Korean dictator. North Korea has an elaborate underground military system with storage facilities and tunnel routes for vehicles and troops. Beaver, a former British army officer with intelligence expertise, said that the tunnel system would allow Gadhafi to conceal troop movements, gain an element of surprise over an enemy, and protect his own troops from pre-emptive strikes. Other analysts are alarmed because the pipeline runs through a mountain called Tarhuna. This is where Gadhafi is constructing a chemical and biological weapons plant, American and European intelligence officials have said. I don’t know if the underground storage was finished, however, the article reminded me of a few articles I’ve read of Italian workers describing Libyan underground military facilities in the desert. Even Tom Cooper of ACIG.org once told me something about a “huge underground depot” capable of containing an entire squadron of aircraft. The problem is not only what these storages contain, but how the hidden material could be used. Gaddafi’s forces have already bombed their own people with cluster bombs, what if they are able to collect chemical weapons possibly sheltered in one of these underground storage facilities?